by Paul Berry on the Home and Family Finance radio show. It’s syndicated nationally on the Radio America Network. Here is the link to the replay. Whew!! Okay, I’m back on the ETF beat. I feel like I’ve just run two marathons with very little sleep in between. I just finished the final edits and put my second book to bed. Dividend Stocks for Dummies will hit the bookstores in April. I expect I will be taking a closer look at dividend focused ETFs now. But in the meantime, check out my first book and the inspiration for this blog, ETFs for the Long Run. ETFs for the Long Run gets the royal treatment on the Nasdaq Stock Market's 7-story high tower screen in Times Square. New York City. To honor the one-year anniversary of the publication of ETFs for the Long Run, I”m a publishing the photos from my biggest media event. Last summer, to help promote the publication of the book and in appreciation for telling the Nasdaq’s influencial part of the history of the ETF, I was invited to ring the closing bell on Aug. 19, 2008. I've just received the Nasdaq's highly coveted blue glass award for effectively closing the market that day from Richard Keary, former managing director of Nasdaq's exchange-traded products business. Without me, people might have traded until midnight. Why publish these now? Well, at the time this occurred I just started the blog and didn’t have the hang of it yet. Then the financial world blew up. My friends and I in the middle of Times Square. When the Nasdaq's behind you like this, you know this is an important book. What are you waiting for? Order a copy now. 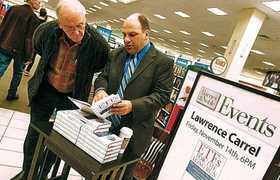 A few weeks later, I had the “good fortune” to have my book hit the bookstores the week Lehman Brothers went bankrupt. At the time, people were worried about the financial collapse of the entire Western World and the coming of the second Great Depression. So, no one really wanted to celebrate a book talking up Wall Street products. But things are better now. I want a redo. So, I’m ramping up publicity and this is the beginning.